New weight loss guidelines for the NHS in England will advise people to "lose a little and keep it off" for life. The National Institute for Health and Care Excellence (NICE) wants overweight people sent to slimming classes with the aim of a 3% weight loss. NICE said even such a small loss - probably of just a few pounds - would cut blood pressure and reduce the risk of type-2 diabetes and some cancers. Two in three adults in England are overweight - with a BMI higher than 25. Someone weighing 15st 10lb would need to lose just over six pounds to cut their weight by 3%. If they were 5ft 7in, their BMI would drop from 35 to 33. Anyone with a BMI of more than 30 is classed as obese. Prof Mike Kelly, the director of the centre for public health at NICE, said the guidelines were about lifelong change rather than yo-yo dieting, when the weight is piled back on after initial success. Media captionSlimmer Kim Laughton tells 5 live: "I put nearly double back on afterwards"
He said that required achievable goals: "We would like to offer an instant solution and a quick win, a much greater ambition if you like, but realistically it's important to bear in mind this is difficult. "It is not just a question of 'for goodness' sake pull yourself together and lose a stone' - it doesn't work like that. "People find it difficult to do - it's not something you can just wake up one morning and decide I'm going to lose 10 pounds, it takes resolve, it takes encouragement." BBC News: Where are you on the global fat scale? Gill Fine, a public health nutritionist who led the team devising the guidelines, said a sustained 3% drop in weight would alter the trajectory of ever-expanding waistlines. She commented: "If people think they've got to lose over a stone, they don't lose a stone and they get disheartened and they go back up - that isn't going to help them. "But if they can just lose a little bit, keep that weight off then that is going to give them a health benefit." This would include some established NHS programmes as well as private businesses including Rosemary Conley, Slimming World and Weight Watchers. Tam Fry, from the National Obesity Forum, told the BBC the guidelines did not go far enough and looked like a "brave attempt to close the stable door whilst the horse is still bolting". He commented: "A 3% reduction may well have some health benefit - every little helps - but if the patient is obese at the beginning of the course he or she will probably still be obese by its end. "At least a 5% weight loss, and preferably one of 10%, have been weight reduction targets in past years and they still should be today. "NICE should be going for the clinical excellence that it's proud of and not the compromise it has suggested." If you are looking for a solution to the obesity epidemic, this is not it. At least not on its own. Obesity is an area of public health where there are no quick fixes. During interviews, Prof Mike Kelly from NICE made repeated comparisons with smoking. Weight-loss programmes are akin to smoking-cessation services, but they don't stop people smoking or getting fat in the first place. Prof Kelly said there was a need to "get a grip on the obesogenic environment". "You can walk down a High Street anywhere in England and you are surrounded by cheap, energy- dense calories and that is obviously part of the problem." 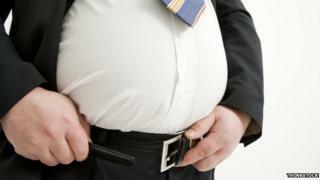 Prof John Ashton, the president of the Faculty of Public Health, said obesity was a major health issue. He added: "These are just the first steps. If tackling obesity were as simple as telling people they should eat less and move more, we would not have a problem now. "Individuals need to play their part, but this guidance acts as a reminder that we also need bold action now from government to reduce the huge costs of treating obesity. "Stronger more effective policy interventions are also needed, which is why we support piloting a sugar duty, to see how successful it will be." Sir Richard Thompson, the president of the Royal College of Physicians, said: "The majority of Britain is expected to be obese by 2050. "NICE's new guidance will help encourage greater co-ordination of services and provide the support that medical professionals need to deliver high-quality prevention and obesity management services."